Happy Saturday my friends! I hope this weekend is treating you well so far. Okay, on to my card today. 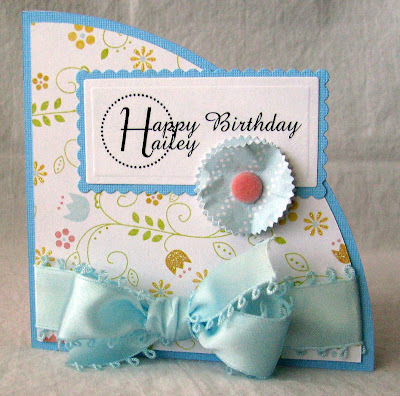 So, I am this month's Guest Designer for over at SweetArts Paperie and I have to show you this lovely paper and ribbon I used from the latest kit called Sugar & Spice! This is for my cousin's little girl so I wanted to personalize it for her. I know how little girls love to see their names on things! I used one of The Cutting Cafe's monogram stamps and then added to it! The "H" with the dots around it is the stamp. The half circle card is also from TCC as well. I love Regina's designs!! I also made another one of my little star burst Nestie flowers too. They are so easy and fun to make! I have lots more goodies to show you using SweetArts Paperie's latest kit, so join me again tomorrow for more scrappy goodness! Have a lovely day! HUGS! This is beautiful. 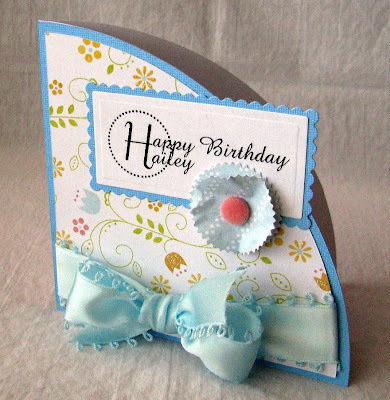 I love the paper you used and how you used the monogram set on this one. What a great shaped card. Love that ribbon too...Yep the whole thing is flawless. I love this DeeDee!!! So SWEET!! 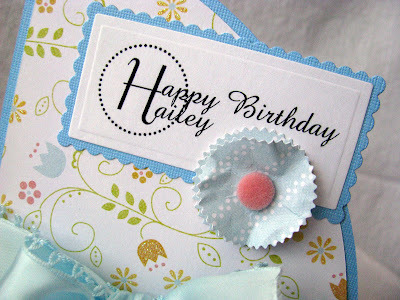 The paper is beautiful and love how you used the monogram! Great card! HUGS!